There has been a lot of news about pets on airline flights lately, so when Southwest Airlines recently updated their statement about traveling with animals, it didn't comes as much of a surprise. However, there was something in there that I wasn't expecting. From the statement. 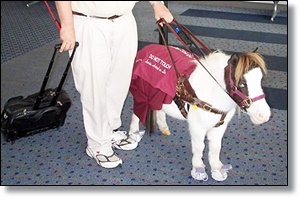 Am I the last person to know that there are service miniature horses? (Let alone, service cats?) I mean, emotional support animals come in all shapes and sizes – peacocks, squirrels, you name it – but service animals are trained and actually act as guides. Horses are smart and seriously intuitive, but I didn't know they could take the place of dogs in, among other tasks, guiding the blind. Which led me down the research rabbit hole to discover that it all makes perfect sense. Here's why.